When a tooth’s nerve and pulp becomes infected, a dentist and patient must decide whether to try saving the tooth with a root canal or to extract it. It’s something we often see at Vanguard Dental Group in Derry NH. There are several factors that affect the decision. These include whether there is an infection in the surrounding bone, the amount and condition of the remaining tooth structure, the strength of the supporting bone, and the presence of periodontitis. During endodontic treatment, the nerve and pulp of the affected tooth are taken out. This tissue contains veins, arteries, and lymph vessels. The dentist or endodontist cleans out the canals. Once the roots are cleaned out and widened, they are filled with a special rubber material that seals them off. 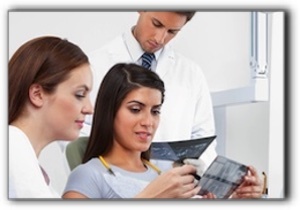 A root canal procedure is just the initial step in the complete tooth restoration process. After the root canal, without a crown, the tooth will probably become dry and brittle. The final steps are the core build-up and crown placement. A durable dental crown protects the remaining tooth, allows normal function, and prevents shifting of the surrounding teeth. A root canal is commonly the most conservative treatment when a root is infected or a tooth has acute decay or damage. Root canals have been performed with success for generations and have a very low failure rate. But there is always a possibility that a tooth with a root canal can have complications down the road. If there was a tiny crack in the treated tooth, it can become re-infected. Teeth with curved roots are more difficult to fill and they can also become re-infected. Occasionally, the tip of a file can break off in a root during the procedure and cause problems. Due to the slight risk of failure, some patients question whether they should just get a dental implant instead. This is not a black and white decision. Like root canals, dental implants have a high success rate. But there are risks with dental implants, as well. If you have been told that a root canal or a dental implant is necessary, talk with us at Vanguard Dental Group in Derry NH about the pros and cons of each procedure. You can count on us for unbiased information so you can make an informed decision about your dental treatment.